North Carolina’s Wicked Weed Brewing and Belgian brewster Hildegard van Ostaden were at Everards Brewery in Leicester recently to brew guest beers for JD Wetherspoon International Beer Festivals. 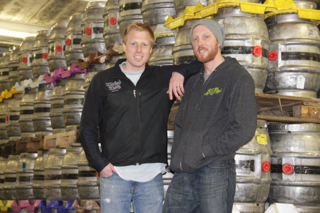 Brothers Luke (29) and Walt Dickinson (32), founders of Wicked Weed Brewing, worked with the Everards team to brew 450 barrels (around 130,000 pints) of a 4.7% amber beer called Sir Ryan the Pounder, which were sold at JD Wetherspoon pubs earlier this spring. 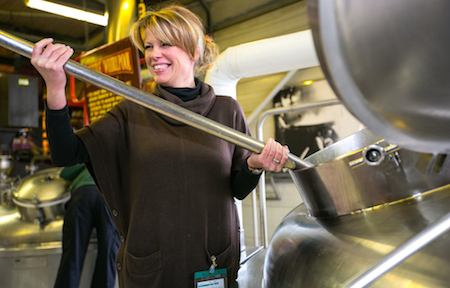 And Hildegard – accompanied by her husband Bas and Belgian brewing legend Willem van Herreweghen – came to Leicestershire to guest-brew a 6% blonde beer called Solange, meaning ‘angel of the sun’, which will be available in JD Wetherspoon pubs soon. Everards has become a regular stop-off for international brewers invited to the UK to brew beers for JD Wetherspoon’s frequent globally-focused beer festivals. Previous visitors include Will Meyers of Massachusetts’ Cambridge Brewing Company and Peter Bouckaert from The New Belgium Brewing Company, Colorado.